Punjab National Bank has topped the list of public sector banks that have displayed a better implementation of the government's ‘reforms agenda’. It was followed by Bank of Baroda and State Bank of India. The BCG-IBA report — EASE (Enhanced Access & Service Excellence Index) Reforms for Public Sector Banks — was released by Finance Minister Arun Jaitley on Thursday. It measures the performance of each state-owned bank on 140 objective metrics across six themes, including customer responsiveness, credit off-take and digitisation. Based on these parameters, PNB came in with a score of 78.4 out of 100, followed by BoB (77.8), SBI (74.6), Oriental Bank of Commerce (69), Canara Bank (67.5) and Syndicate Bank (67.1). The report stated that PNB showed a "strong performance" in the parameters like customer responsiveness, responsible banking, credit off-take and financial inclusion. Releasing the report, Jaitley said such rankings brought about competitiveness and encouraged banks to perform better than their peers. “The bank (PNB), which suffered both in terms of finance and transiently, in terms of reputation because of a fraud practice and in nine months had to set aside Rs 14,000 crore for bad assets, rapidly transformed itself into an evolving institution and after a period of nine months in the last quarter declared a profit. It then emerged as the best-performing bank,” Jaitley said. At the event, the finance minister also said the Narendra Modi government will continue following a policy of amalgamating public sector banks to create only a few but giant state-owned lenders which are globally competitive. The government has taken a number of steps to make banks financially sound and healthy, whether they are legislative steps or important measures like "creating healthy large banks, which can be globally competitive", said Jaitley at an Indian Banks' Association (IBA) event. "The government will continue to gradually follow a policy of amalgamation." In January, the Cabinet had approved of the merger of Vijaya Bank and Dena Bank into BoB. This will make BoB the third largest PSU bank after SBI and PNB. The top ranking for PNB, which was involved in the Rs 14,356-crore Nirav Modi fraud, came after it swung back into the black in the October-December quarter after posting losses in the previous three quarters. 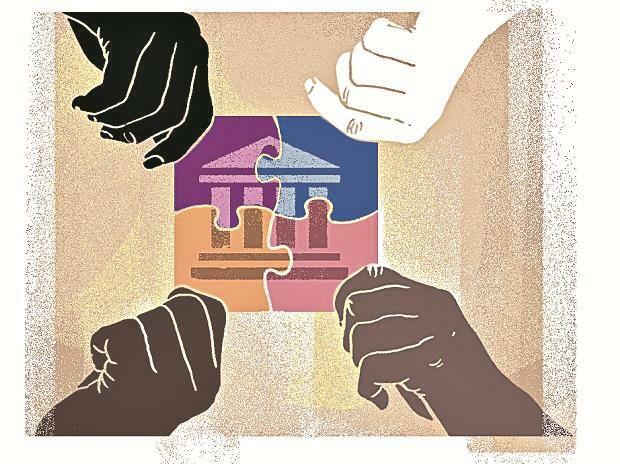 The six PSU banks, which continue to be under the RBI’s prompt corrective action (PCA) framework, too, have been ranked in the report. These are Indian Overseas Bank (66.7), UCO Bank (64.1), United Bank of India (60.8), IDBI Bank (60.2), Central Bank of India (55.7) and Dena Bank (53.8).